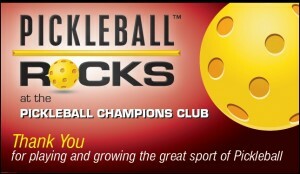 Hey Pickleball Nation,One of the most asked questions we get from people who are actively trying to grow their community is this: How do I get my local church or YMCA or school to let us play pickleball at their facility? It’s not that they won’t work with you. It’s just that your approach to getting them to work with you might need to change. In our communities, our success has always been based on a specific, well-planned strategy. OUR STRATEGY? We never approach any facility unless we have already had some key person in that facility try and embrace pickleball first. Example 1: I have a friend who plays with us, who is friends with a Baptist minister at a church about 15 miles from us. He asked his Baptist minister friend to do him a favor and come try pickleball. He wasn’t approached with “hey you might like this and then we can use your church”. He was approached by his friend to try it personally because we thought he would enjoy the fun. The Baptist minister immediately fell in love with it and painted an indoor court and two outdoor courts at his church. Example 2: I have a friend who is a Phys Ed teacher in our school system. I asked him to do me a favor and meet me at our outdoor courts to try this silly sport. He instantly loved it, put it into the school curriculum and now helps us get indoor gyms to use in the wintertime. Bottom line is, If you think THE MAYOR is the key person who can help you get a place to play, then find someone, who knows someone, who knows the mayor well enough to invite him/her to play. Find and invite the right individuals to play who you or one of your players already have a relationship with. Once they are hooked, they will naturally help you get a facility that they have some influence over. The old adage “it’s not what you know, but who you know” is very true when it comes to finding facilities to play pickleball. It’s not about shouting the benefits at people. We all know that doesn’t seem to work. Find the right people and they will do the rest for you.